You already know the benefits of block scheduling! Setting it up in Prime Suite is easy, and can be accomplished by following the steps below! Go to the Schedule menu and select Appointment Scheduling. Select the Block Scheduling button. Drag the icon to a time slot and release. Select the check box next to each resource requiring the block time. If needed, you can add resources other than the ones you have shown on the grid view. (Optional) Make changes to the Start Time using the drop-down lists. (Optional) Make changes to the End Time using the drop-down lists. (Optional) Type a new Start Date and click + or click the date on the calendar to add the date to the date box. (Optional) Type an additional Description. Go to the Schedule and select Appointment Scheduling. 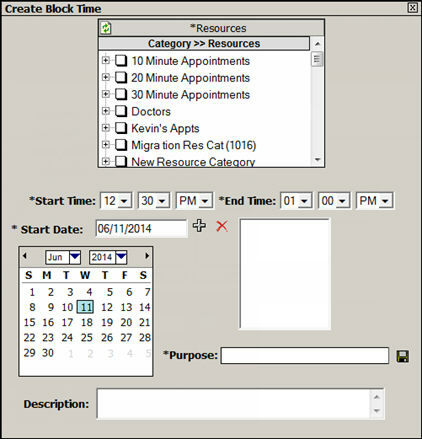 Click the Block Scheduling button and drag to a time slot on the Schedule Grid and release. Select the Resource(s) you wish to block. If Multi-Location, click link and select Location(s). Add date using the Start Date field Enter the first date you wish to block. Press ENTER or select the + Icon. Repeat until all dates are listed in the Multi Date Box. Enter the Purpose of the Block Time. (Optional) Enter a Description of the Block Time.